Brentwood HS defensive coach Colin Hart joins MLL team Atlanta Blaze for 2017 Training Camp. 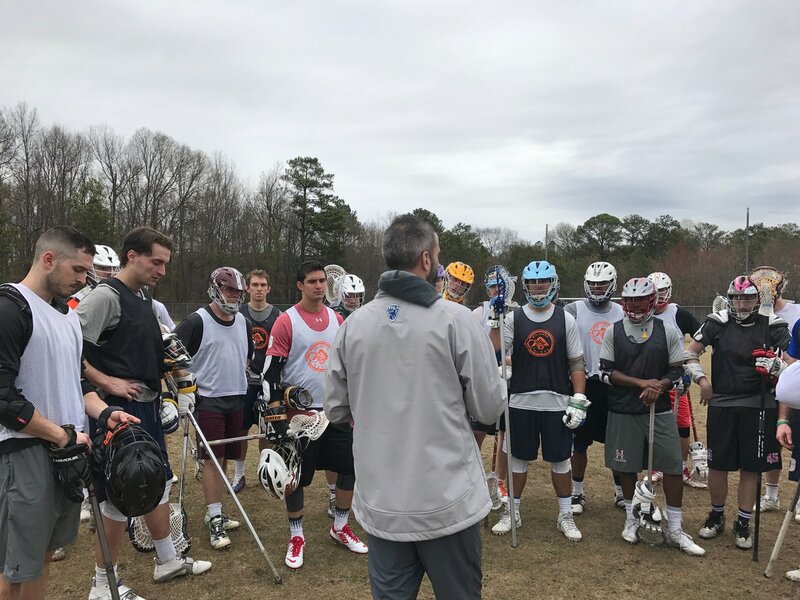 KENNESAW – The sky was blue, the sun was out, and the wind was mild this past Saturday morning as the Atlanta Blaze’s season unofficially began. Thirty young men – decked out in an array of helmets and pads – sprinted up and down the field at the Kennesaw State University’s Marietta campus fields in the hopes of impressing the Blaze coaching staff enough to make the training camp roster in a couple of weeks. The tryout began with Head Coach David Huntley and General Manager Spencer Ford calling all the players into a huddle to discuss expectations for the afternoon, and it wasn’t long after that that the pace and energy of the day picked up exponentially. Before the first hour was up, the coaches were running the players through drills building up to a half field scrimmage, and continued to run drills in this setup until shortly after noon. From a casual observers’ perspective, there looked as if there might be six or seven players that stood out as serious contenders for spots on the training camp roster, and after an intense and physical two-and-a-half-hour tryout, a single man was selected to participate in the prestigious Atlanta Blaze training camp. Colin Hart, a defender from Brentwood, Tenn., will join the Blaze at their first training camp of the 2017 season on March 31 st. Hart, who attended Bellarmine University, will add to the culture Ford and Huntley are trying to cultivate in Atlanta and is a familiar face, having been invited to the Blaze’s 2016 training camp as well. When asked about the opportunity, Hart said “I was pretty excited when I found out; that being said, I was invited last year and got cut, so I know there is more work to be done.” Hart, who works for Lacrosse Nashville and as an assistant for the Brentwood High School Lacrosse team, said that he prepared for the tryout by running and lifting to stay in shape so he can physically compete with the guys on the team. Coach David Huntley added to what Ford said, saying that he “thought all the guys gave great effort and competed well”, but went on to praise Colin for “showing us a lot [during the tryout].” Both were direct in expressing their excitement to get him out on the field at training camp and see how he measures up against the rest of the team. The college lacrosse season is in full swing, the Blaze’s home opener is just 37 days away and the professional players are chomping at the bit to get back out on the field.The excitement from the fans and Blaze personnel alike made one thing clear: lacrosse is back. Fifth Third Bank Stadium is an 8,300-seat state-of-the-art stadium built in 2010 in partnership with the former Women’s Professional Soccer team Atlanta Beat, designed to showcase a variety of events. It has hosted Major League Soccer, KSU Soccer and Lacrosse, the Southern Lacrosse Showdown, NCAA Women’s College Cup, concerts and music festivals. Situated within a beautiful 88-acre KSU Sports and Recreation Park, the facility is conveniently located just one mile from both I-75 and I-575 in Cobb County, which is often referred to as Atlanta’s sweet spot.